Posted on February 4, 2011, 3:08 pm, by admin, under New Projects, Recent News. 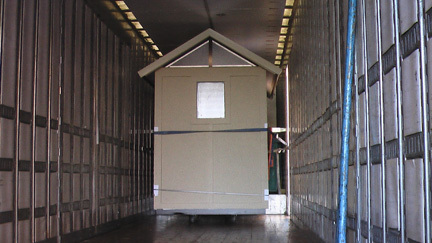 In December 2010 Clivus Multrum pre-fabricated 6 M54 Trailhead buildings for an order from Lee’s Ferry a National Park which is adjacent to Grand Canyon National Park. Those systems shipped earlier this year. Here are a few pictures of the build process and of loading them onto the truck. The Trailheads have since arrived in Lee’s Ferry and are likely to be installed within the month! In order to get the systems to their locations park staff will deliver them on rafts that travel down the Colorado River.